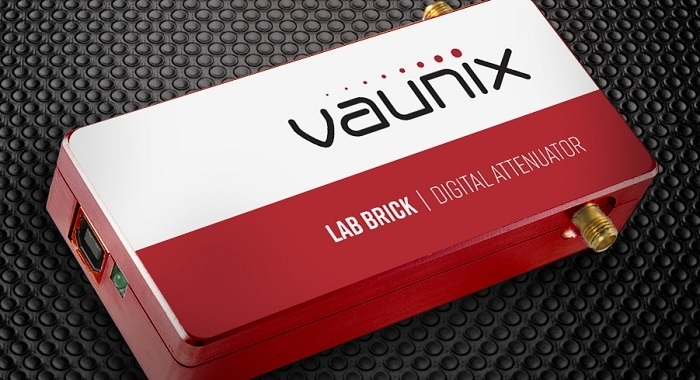 Vaunix has introduced a new Digital Attenuator, the, LDA-906V, under its Lab Brick LDA series of Digital Attenuators to bring affordability, functionality, reliability and simplicity to the microwave test bench. Capable of bi-directional fixed attenuation, swept attenuation ramps, and fading profiles, The LDA-906V Digital Attenuator is a highly accurate 50 ohm step attenuator. It provides calibrated attenuation from 200 to 6000 MHz with an impressive step size of 0.1 dB and typical accuracy <0.25 dB over 90 dB of control range. It is ideal for testing WiMAX, 3G, 4G, 5G, LTE, DVB, and Microwave Radio Fading Simulators. The LDA-906V unit’s power and control connection is from a standard USB type-B female. Two counter-bore holes are providing for efficient mounting and placement. The 1-channel digital attenuator is designed to operate reliably from -30 +70 oC. Lab Bricks use a native USB HID interface to avoid the difficulties inherent in using older serial or IEEE-488 interfaces implemented over USB. As a result, Lab Brick users can get to work faster without having to install kernel level drivers, and Lab Brick devices can be easily used on any system that supports USB HID devices, including low cost embedded computers using Linux or similar operating systems. Vaunix will be showcasing their range of USB Controlled Test Equipment at IMS 2018. Click here to see more updates from IMS 2018 on everything RF.